Twenty years after Bosnia's peace deal, Mostar -- once an emblem of hope -- has become a symbol of stagnation: Croats on one side, Bosniaks on the other, and rats everywhere. MOSTAR, Bosnia and Herzegovina — The city of Mostar has a rat problem. 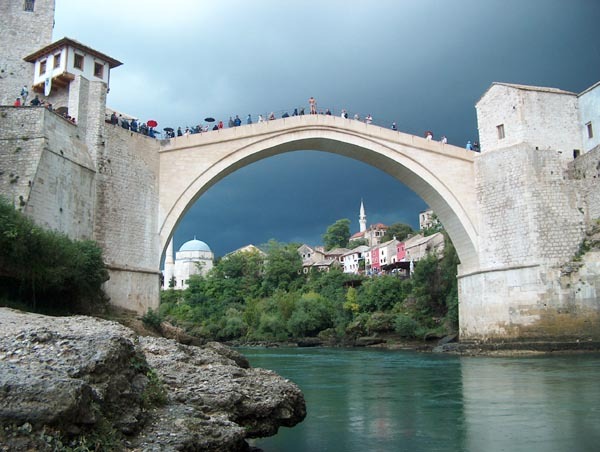 The southern Bosnian city is famous for its bridge, a stunning restoration of a 16th- century structure, which arcs above the Neretva River, and serves as a striking limestone reminder of the accomplishments of Ottoman-era architecture. But it is also becoming infamous for its rodents. Those who venture outside the well-maintained historic city center find overflowing trash bins and piles of uncollected waste that have become a haven for vermin. A single trash bin might have dozens of rats crawling inside. The rats and trash piles aren’t just a blight; they’re a public health threat. Mostar now has the highest rate of scabies in Bosnia. Last month a local NGO called Scream delivered a petition to the regional government with 2,500 signatures calling for the “de-ratization, de-insectization, and disinfection” of their city. But, two decades after the end of the Bosnian war, de-ratization is much harder than it sounds. It’s not that there’s nobody responsible for cleaning up Mostar’s trash — it’s just the opposite. The city has five garbage collection companies, a legacy from the days when the city was split into six units after the war — three for Croats in the west, three for Bosniaks in the east. Each of these units (except for one) now has its own collection company; but the collection companies can’t agree on their regions of responsibility. The bureaucratic squabbling has left garbage piling up on street corners; and the garbage has lured the rats. Twenty years since the signing of the Dayton peace agreement, which ended the war in Bosnia and put in place the country’s complex constitution, Mostar remains a divided city. And its rodents are a disease-ridden symbol of an accord that was once hailed as a breakthrough in peace-building and integration. Mostar, the fifth largest town in Bosnia, is the crown jewel of the southern Herzegovina region. Founded in 1452, and named for the “bridge watchers” or mostari, who once lived in towers on opposite sides of the Neretva River, the city flourished as a result of its location on a trading route from the ancient port of Dubrovnik. The city grew under Ottoman rule — it’s said that Sultan Suleiman the Magnificent himself ordered the erection of the famous Old Bridge in 1557 — and, when Yugoslavia became an independent state, it became an emblem of its ethnic diversity. The city’s population in the late-twentieth century was 35 percent Bosniak, 34 percent Croat, and 19 percent Serb; the communities mixed freely and intermarriage was common. That was until war arrived in 1992. Mostar came under siege for a total of 18 months. Bosniak troops in the east and Croat troops in the west jointly fended off Serb forces, before the Croats turned on the Bosniaks and fighting raged between them. By the time the Bosniak-Croat battles ended in December 1993, conditions were so bad that the chief U.N. official in the city said its inhabitants were “living like rats” in the basements of their homes. After the war, most of the Serbs left, and the city, which had once been completely mixed, separated exactly where the front line had once been, a boulevard just yards to the west of the bridge. But the days of intermixing seem like a distant memory. The entire administration of the town is divided along ethnic lines: There is one electricity provider for Bosniaks, one for Croats; there are two public bus companies that don’t acknowledge one another’s routes. The city’s education system teaches Bosniak and Croat students in the same buildings, but separates them based on ethnicity and offers them wholly different curricula. In most schools, students are simply separated into shifts: one ethnicity attends in the morning and the other in the afternoon. From postal systems, to telephone services, to cable networks, the city duplicates practically all of its services, with residents expected to foot the bill. The bureaucratic dysfunction in Mostar is a microcosm of the problems plaguing post-war Bosnia as a whole. The Dayton agreement split Bosnia and Herzegovina into two “entities” along the former front lines: Mostar, and most of the capital, Sarajevo, fell into the mainly Bosniak-Croat Federation of Bosnia and Herzegovina; the rest of the country’s territory into the predominantly Serb Republika Srpska, or Serb Republic. The two were gingerly stitched together by a thin overlapping layer of bureaucracy at the state-level and a complex series of power sharing agreements. As a whole, the country now has three rotating presidents: a Bosniak, a Croat, and a Serb. The Bosniak-Croat Federation alone has 10 cantons, and in total the country has 14 governments, 180 ministers, and 700 parliamentarians for a population of less than four million. The bloated administration of the country on the national level costs more than 40 percent of Bosnia and Herzegovina’s GDP, according to the IMF. Despite all its problems, for its first 10 years, Dayton was widely considered a successful agreement. The country’s three warring armies were successfully incorporated into one; and customs, taxation, and intelligence agencies were combined as well. In that period, almost one million people returned home out of some two million displaced during the war. “In those first 10 post-Dayton years, Bosnia was the global poster-boy of post-conflict peace building and integration,” said Lord Paddy Ashdown, who from 2002 to 2006 served as high representative for Bosnia and Herzegovina, an office created by the Dayton agreement to oversee its implementation. Mostar, in this period, was treated as an emblem of hope across post-war Bosnia. In 2004, the Old Bridge, which had been destroyed by Croat forces in November 1993, was reopened after a meticulous restoration to much international fanfare in a ceremony attended by dignitaries including Prince Charles. That same year, Ashdown decided that he’d had enough of the duplication and bureaucracy that had crippled Mostar’s governance since the end of the war. Things didn’t work according to plan. In Mostar, at the time of Ashdown’s statute, 75 percent of citizens said they believed in a unified city, and 83 percent said no one ethnicity should govern Mostar. But implementation of the statute proved a near-instant nightmare, which saw 14 unsuccessful attempts to elect a mayor, the failure to pay employees for months, and immediate complaints by both sides. Croat leaders proved unwilling to give up a guarantee on power in Mostar, where they hold a slight majority, despite making up just an estimated 13 percent of the population in Bosnia as whole. They called Ashdown’s statute discriminatory, and took their complaints to the Constitutional Court, which ruled in 2011 and 2012 that the statute must be changed to give all voters equal power, reversing Ashdown’s protections for minorities. Meanwhile, the country’s ethnic cracks are widening: In Republika Srpska, President Milorad Dodik openly flirts with secession; following Dodik’s lead, Bosnian Croat leadership has been pushing to split the Federation and create a “third entity,” for the 13 percent of the population who are Croat. Today, Mostar’s politics are at a standstill. Ashdown’s statute has yet to be reformed; the city’s two main political parties, the Croatian Democratic Union (HDZ) party and the Bosniak Party for Democratic Action (SDA), are deadlocked over a solution. As a result, the city has not held elections in seven years. One of the city’s few elected officials at the moment is the mayor. Ljubo Beslic, 57, is a Croat who has held office for eleven years — the last three of them with no city council. There is no agreement over who could legally fill his shoes if something were to happen to him. The deadlock is such that the last time the city council met, in 2012, the outgoing city council could not agree on a budget, meaning Mostar has been left for periods without a budget to pay for services, including kindergartens, heating for schools, fire-fighters, waste disposal, and even soup kitchens. The Bosnian parliament had to intervene in January 2014 to give the mayor and the city’s Bosniak head of finance the right to make decisions about temporary financing. Over time, the impasse has created its own sort of inertia: Elites have no interest in ending the gridlock, because divided electoral units and duplicated bureaucracies mean more jobs to distribute to party functionaries as part of patronage networks, said Bosnia analyst Jasmin Mujanovic. Government employees can earn six times the average salary in the country. In 2009, a group of citizens proposed replacing mayor Beslic with a donkey in protest of the political dysfunction. But at present, negotiations over Mostar’s governing system are part of country-wide discussions on electoral reform — meaning the city’s residents can do little but sit and wait for a decision. “Mostar could be the most beautiful city in the country, but the unresolved relationships at all levels in Bosnia and Herzegovina affect this city,” said Vedran Arapovic, founder of Scream, the local NGO. He worries that the economic and political stagnation is encouraging young people to leave. In a recent poll of young people across Bosnia, 83 percent said they would leave “tomorrow,” if they could. But Beslic, the mayor, holds out hope for his riven city. In spite of its current electoral crisis — which shows no signs of ending – the town has managed to make progress, he said. Today, he said, there are. They just go to school in separate classrooms, in different shifts. Habits of separation are hard to break for the city’s inhabitants — except for its rats, of course, who have never discriminated between the neighborhoods where they congregate.